Thanksgiving is nearly here! In keeping with the spirit of the season, I’d like to say thank you for your business and referrals. 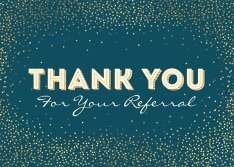 Your business and referrals are essential to our continued success. That’s why we’re always here to serve YOU! Keep reading to see how I can help you with more than just buying and selling a home! Thanksgiving is the ideal time to think about what we’re most grateful for; however, our gratitude doesn’t stop there. The information in our blog this month with provide you with tips to improve every day, from keeping a gratitude journal to simply focusing on what you have! Leave a comment below with how you practice gratefulness, we’d love to hear your suggestions! It is an ongoing pleasure to serve you and I look forward to helping you meet your real estate needs in the future. Not thinking of buying or selling a home anytime soon? We’re always here to serve you, whether you need a reputable tradesperson or have questions about anything related to real estate. Trade Referrals – I’m in touch with lots of trustworthy trade and service professionals in our community. Whether you need a referral to a plumber or the phone number of a moving company. I’d love to refer you! Outline Local Market Activities – What’s the outlook for our market? Is this a good time to buy or sell? How much is your home worth? I’ll let you know what’s going on in our local area and give you a FREE market analysis of your property! Objectively Answer Real Estate Questions – Whenever you have a question, contact me for an honest answer and advice. I’m happy to share my knowledge and expertise about our market and the real estate process. Connect you with my network – If you decide to move, I’ll be sad to see you go; however, I can still connect you with a real estate professional in your desired area who will offer the same high level of service you expect. You’ll be taken care of as if I was helping you myself. If you know someone that would appreciate the level of service I provide, please call me at 970-985-8555 or email me below! I’ll be happy to reach out and take great care of them!